Coalesce Warm-Up: As If. 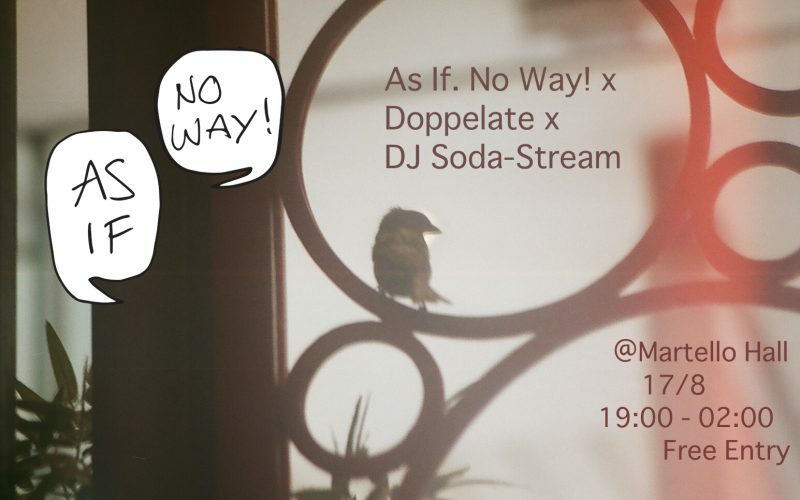 No Way X Doppelate X Dj Soda-Stream | AS IF. NO WAY! Once entering our comfortable and inclusive space, you will be immersed in our unique collection of records that delve into surreal, challenging and gripping atmospheres, creating an environment that is down to your own interpretation. Thomas and Blake are joined this month by Ian Erik visiting from Berlin, packing records and his own field recordings from travels and moments. Ian Erik’s solo set will be exploring guitar riffs, giving those sounds rarely played on DJ equipment a spin around the block. A crate digger and party starter who is known for his dynamic and (very) extended sets. He’s been throwing parties all over London for years now and hosts the Soft Drinks show on Balamii radio alongside Doppelate. We’re very excited to invite Doppelate and his enigmatic music collection to Martello Hall; with some exciting releases and club appearances in the pipeline alongside his monthly Balamii Radio show with DJ Soda-Stream, expect anything and everything from all four corners of the globe. Stimulating quirky animations that react to the sound of the room, Chelsea Collage of Art graduate Dan Rowan Smith using MaxMSP, engages your visual senses through a glitch of psychedelic and charismatic visuals.